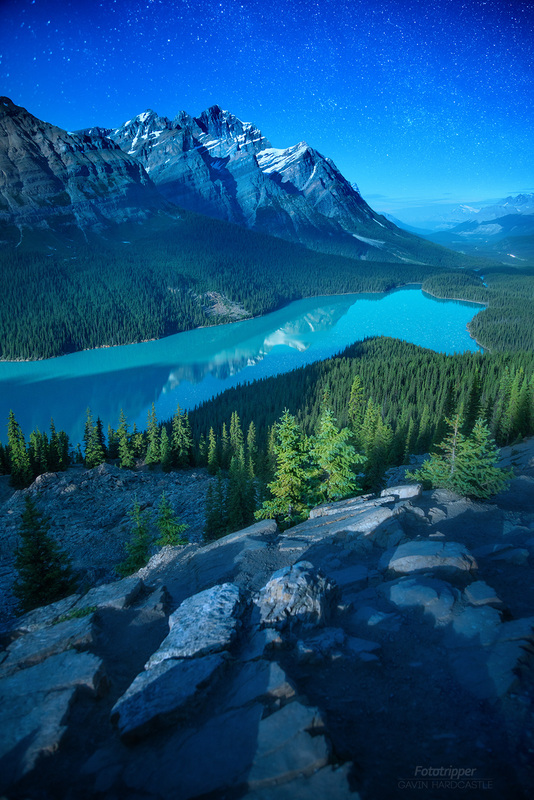 Peyto Lake never fails to amaze with it’s pastel blue waters and ominous peaks looming impressively overhead. It’s not the easiest place to photograph but a challenge that I love to give to my September Banff Photography Workshop students. Moonscapes hold a special fascination for me so I’d had this image in my mind for a long time. All I needed was the right conditions to fall into place as I’d already scoped out my composition from many sunrise shoots. I’ve learned that weather forecasts in the Canadian Rockies are sketchy at best but when all sources call for zero clouds day after day, it’s as reliable as you can hope for. That night, the moon was so bright I was able to shoot this at f/8 for 30″. For full disclosure, I pasted a bunch of extra stars into the sky there. With the moon that bright there are very few stars that make it into the shot. If you’d like to order a high resolution print of ‘Peyto Moonglow’, please get in touch via my contact form and let me know your preferred size. Prints can be provided under acrylic, on metal, paper or even mounted and framed depending on your taste.